For those of you who have lots of expense reporting, or who are slowed down by the expense approval process, I have good news. 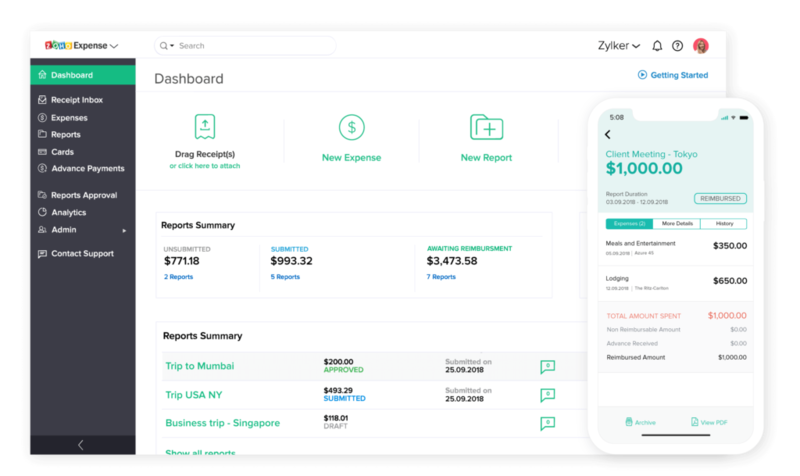 Zoho has an easy-to-use expense report to make your entire process seamless. It’s true, no one really loves expense reports. But you’ll change your tune when you try Zoho’s expense reporting software. The app makes it easy to automate your expenses by turning receipts into expense entries. You can then turn in your entire Expense report with just a single click (no more photocopies, receipt-filled envelopes, or complicated spreadsheets). Transactions are easily imported via your computer, a cloud account, or even from your phone. Or, send an email directly to your Zoho Expense account. If you’re spending on a card, it’s even easier. Import your card transactions and turn them into expense entries right inside the app. All of the functions are available inside the app, making it easy to track your expenses right from your phone. Typically, expense reporting takes a lot of manual entry. This expense reporting software is different. When you use the auto scan feature, your receipts are automatically turned into expenses. The feature reads your receipts and automatically pulls the most important data (amount, date, merchant name, etc.). After the expense report is created and accounting reimburses the expense, it’s easy to track your reimbursements. When the entry is reimbursed online, it’s automatically recorded as reimbursed at Zoho Expense. Then, the entry is automatically posted in Zoho Books. This means, if you’re using Zoho Books, there’s no need to re-enter any of this information inside your accounting software. This saves valuable time and creates accurate reports. No more double entry and no more transcription errors! Not to mention… your accounting team is going to love you! Having software that fully integrates with your other systems is invaluable. When technology “talks” to each other, teams save time and get more accurate data. See your expenses by Client or by Deal inside of CRM. Have each expense be automatically categorized in your Zoho Books account. Employees will love using the software on their phone. Since most expenses occur on the road, having an easy-to-use app makes tracking faster. The automatic feature takes tedious data entry out of the equation. The reports available inside Zoho Books means you’ll always know where your money is going. Choose to view reports based on expense category, policy, or even based on violations. Create an approval process for each expense or only those over a specified amount. Require expenses be submitted within a specific time period. Remind users to submit their expenses. What’s not to love. Zoho Books is a great way to create and track expenses. Give it a try! I think you’ll be pleasantly surprised how much you’ll actually grow to love expense reporting (or maybe just dread it a little less)!